Improvement of dorsalgia (dorsispinal pains) treatment quality by means of magnetotherapy involvement in treatment-and-reabilitation procedures. Vertebral column osteochondrosis which is characterized by intervertebral disk and adjoining to it vertebra bodies dystrophic changes is one of widespread diseases of locomotor system according to different authors 50-80 % of adult population suffer it. Disease main symptoms are pain and locomotor disturbance. Disease related factors as: disease rising rate with temporary loss of disability, disease tendency to progressing clinical course often resulting in the physical disability; patients diagnostics, treatment, employment assistance related considerable material expenses define its high social importance. In view of the last data the issue of patients with lumbar spine osteochondrosis medical treatment is reconsidered now. Complex application of pathology proved physiotherapeutic factors in complex treatment-and-rehabilitation process gets much more growing recognition. Their distinctive features are physiologic characteristic , absence of allergic symptoms (manifestations) , an ability to have action (influence) upon disease pathogenesis section and an organic combination with others medical methods. Despite of an existing wide range of therapeutic complexes, results of their application cannot completely satisfy clinicians and analysts due to both their insufficient efficacy and a short remission period after taken treatment course. In connection with this, taking into account disease high medico-social significance, it is necessary to recognize development of new complexes of non medicinal conservative therapy as substantial and perspective. Rising of lumbar osteochondrosis disease patients treatment efficacy by « АLMAG-01» device “travelling magnetic field” low-frequency magnetotherapy application in complex treatment. In a basis of the trials there has been put the analysis of 215 patients with a lumbar osteochondrosis (42,7% men, 57,3% women) among them 91,6 % of able-bodied persons at the age of 35 – 59 years old . The period of patients examination: from 2008 till 2010. All patients on the basis of a random choice have been divided into two groups. Patients of the first (control) group (125 person) have taken the traditional complex conservative therapy including orthopedic procedures, medicamental treatment. Patients of the first (control) group (125 person) have got the traditional complex conservative therapy including orthopedic procedures, medicamental treatment, therapeutic physical training, massage. Course of treatment – 20 days. Those patients presented themselves a comparison group. The patients of the second (basic) group (90 person) in addition to a traditional complex took « АLMAG-01» device magnetotherapy. The exposure of vertebral column problem zones was carried with a help of « АLMAG-01» device north pole. In order both to examine the initial state of patients with a lumbar osteochondrosis disease and taken treatment efficiency assessment all patients have been subjected to complex diagnostic examination: interrogation, medical examination, manual examination, roentgenography, computer tomography, electromyography. Clinical examination has shown that the great number of patients under examination (79,2%) complained of lumbar spine pains in the state of rest (48%) and locomotion (56,1%). 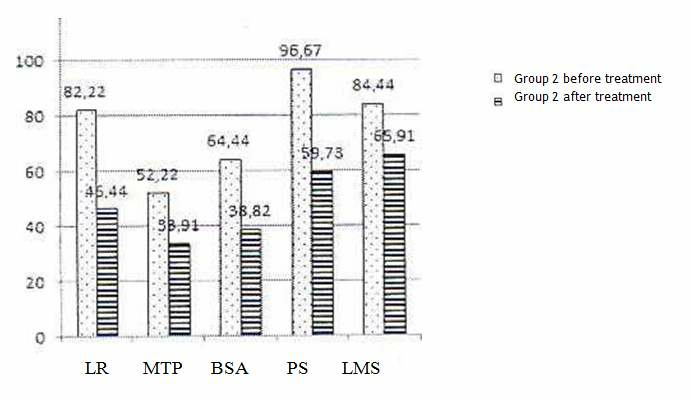 Clinical examinations results have shown that in the process of complex treatment conducting there was a natural regress of the basic clinical parameters in both groups (fig. 2). 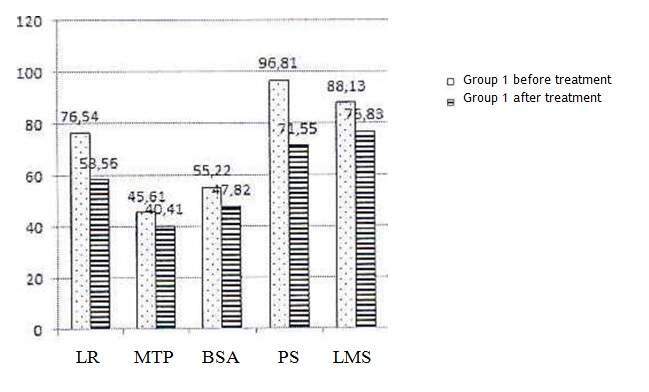 In the first group there was the tendency to their reduction, in the second group there was obvios decrease of lumbar spine pathbiomechanic changes frequency. LR – backbone locomotion restriction; MTP – the presence of myogenetic trigger points; BSA – backbone shape abnormality; PS – pain syndrome; LMS – optimum locomotor stereotype deflection. Fig. 2. Lumbar osteochondrosis patients basic clinical signs (symptoms) before and after treatment (%). Clinical picture dynamic has shown, that backbone shape abnormality BSA in lumber spine reduced by 26% (р<0,05), in the second group, while in the first group – by 8%; backbone locomotion restriction (LR) reduced by 36% (р<0,01) in the second group, in the first group – by 18 %; locomotor(y) pain syndrome (PS) reduced by 37% (р<0,05) in the second group and by 25% in the first group; 29% (р<0,05) of second group patients had no signs of optimum locomotor stereotype deflection (LMS) in comparison with the patients of the first group where only 12% of the patients had the same parameter. While in paravertebral zone palpations the disappearance of myogenetic trigger points (MTP) was marked in 19% (р<0,05) of cases in the second group, in the first group this percent came to 8% . The data of both groups standard radiological examination have revealed the presence of typical osteochondrosis signs. Besides there have been stated the range of other local radiological changes, as follows: backbone shape abnormalities (hyperlordosis (27,8 %), lordosis flattening (75,5 %), kyphosis (69,3 %), scoliosis (42,2 %), disk calcification(2,9 %), spondylolisthesis (7,5 %), Shmorlya`s hernias (4 %), spondylarthrosis (14,7 %). When carrying out roentgens – functional trials it was marked that 14,5 % of patients had instability , 4,6 % – hypermobility, 34,6 %- lumbar spine flexion restriction, and 21,8 % – extension (flexion). Application of magnetotherapy in complex therapy for patients of the second group facilitated to lumbar spine structurally – functional changes positive dynamics. The data of X-ray trials of the second group patients have marked intervertebral disk height enlargement (37,83 % of patients) , regeneration of backbone shape abnormality (24,39 %) and eliminations of flexion restriction (29,56 %.). While in the first group the stated changes have taken place in 13,33 %, 12,28 %, 14,05 % cases accordingly. Treatment results сomparison according to roentgens – functional trials data proved reliability and more obvious increase of flexion – extension and lateroflection parameters in the second group. Thus in the first group of patients with a lumbar osteochondrosis the maximal values of flexion – extension angle had 36,6 % (р> 0,05) increase. The increase of lateroflections towards the “sick” part came to 55,4 % (р> 0,05), “healthy” one was to 26,1 % (р> 0,05); in the second group the volume of locomotions obviously came to 68,3 %, 937 % and 817 % (р <0,05) accordingly. The clinical picture of muscles bioelectric activity before lumbar osteochondrosis patients treatment was characterized mainly by asymmetry and accompanied by qualitative and quantitative changes: increase both of polyphase potentials quantity and the quantity of turns and phases in potential`s commissure parts as well as the presence of single fasciculations in the state of rest. The similar changes had been revealed in 29,5 % of cases that testified to the overload of one and the same motor units (parts) of sceletal musculature muscle fibers. Lumbar osteochondrosis patients` electromyography picture quantitative estimation has revealed authentically the significant predominance of biological potentials amplitude in paravertebral muscles (multiseparate and back straightening) hypertone zone. 78 % of patients were marked with electromyography picture improvement testifying to the improvement of muscles functional state in lumbar spine as a result of taken treatment course and carried out treatment procedure. After treatment among the examined patients of first group EMG of 1 type was stated in 57,9 % of cases (73 patients) and – 68,8 % of cases (62 examined patients) in the second group EMG of 2 b type was defined 42,1 % of cases (52 examined patients) in the first group and 31,2 % cases (28 patients) in the second group. For the observation period in the second group there was revealed obvious decrease of paravertebral muscles biopotentials amplitude asymmetry coefficient (from 21,4±3,1 up to 2,2±1,6) , and in the first group in the hypertone zone with the maximal tension similar parameters have been less obvious (from 20,5±2,8 up to 12,3±3,1). Table 1. First and second group patients lumber spine paravertebral muscles electrobiological activity asymmetry coefficient dynamic before and after treatment course (М±т). Long-term results had been estimated after the expiration of 6 months. Catamnesis data showed more favorable long-term results of treatment in the second group where exacerbations specific ratio within the next 6 months came to 4,4 % in comparison with the first group – 47,4 %. Influence of the developed complex for the period of acute symptoms manifictation stopping was defined. It was marked, that in the second group lumbar osteochondrosis exacerbation period lasted for 6± 0,2 days, whereas in the first group – 9±0,5 days. The taken results of lumbar spine osteochondrosis patients treatment had been estimated according to criteria: “excellent”, “good”, “satisfactory”, “unsatisfactory”. Results “excellent” estimated criteria meant : pain syndrome complete cupping (stopping), regeneration of locomotor volume, normalization of lumbar spine structural functional parameters and absence of exacerbations for examination period; “good” – complete cupping of pain syndrome , regeneration of locomotor volume, particulate regeneration of structural – functional parameters and the presence of long remission; “satisfactory” – presence of periodic pains when doing physical exercise, locomotor partial restriction , absence of structural functional changes progressing, presence of exacerbations no more than two times a year. Result was considered as “unsatisfactory” with the presence of the pain syndrome, the evident locomotor restriction, progressing of pathomorphologic symptoms with often exacerbations. Comparative assessment of the standard and offered complexes efficacy identified clinic-statistic indexes stipulated by demonstrative medicine techniques. There were determined following efficiency indexes : а) relative benefit increase came to 73,7 %; b) relative risk reduction came to 59,8 %. The taken data has testified that the application of ” travelling ” magnetic field magnetotherapy for patients with lumbar spine osteochondrosis is more effective in comparison with traditional treatment that has been proved by relative risk 59,8 % reduction, and relative benefit 73,7 % increase. The application of “travelling” magnetic field magnetotherapy facilitates the increase of medical procedures efficacy in disease subacute period. Application of “travelling” magnetic field magnetotherapy is characterized by higher therapeutic efficacy facilitating 15,5 % reduction of disease clinical manifestations (sympromes) in comparison to traditional treatment. Under the influence of magnetotherapy there are positive functional and structural changes in the backbone affected segment: asymmetry coefficient of paravertebral muscles bioelectric quantitative indexes (values) has 20,1 % decrease, the height of intervertebral disks has increased by 24,5 % in comparison to standard treatment. Long-term results analysis on the basis of demonstrative medicine principles have proved “travelling magnetic field” magnetotherapy, as a part of developed medical complex, efficiency. Under the influence of the developed medical complex there was marked : the increase of excellent and good long-term results quantity from 44,8 % up to 77,8 % (relative benefit increase came to 73,7 %), and the reduction of the number of unsatisfactory results (aggravation frequency) from 9,6 % up to 3,4 % (relative risk decrease was 59,8 %).